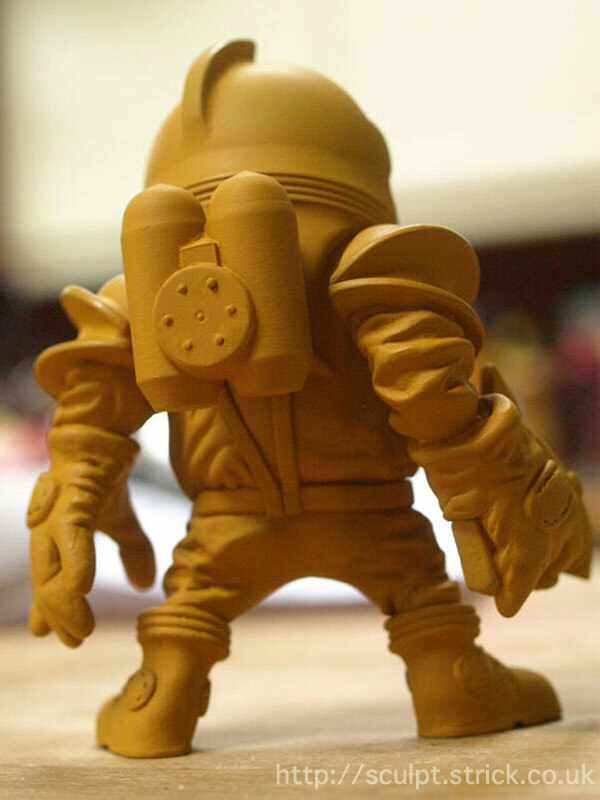 The plan for Ray was to produce a figure where the head would be 'blind-packed' (meaning that several versions are available and you don't know which design you have until you open it) with the blind aspect being provided by the helmet itself. I drew some back-of-an-envelope character sketches and then refined them to more detailed full size versions. The designs would later be modified to better suit the toy format; clearance was needed for articulation and thought was given to undercuts that would affect the casting process. I also made the pose more dynamic. The space suit was meant to suggest the look of the Nostromo suits in Alien, combined with the classic look of golden age sci-fi. 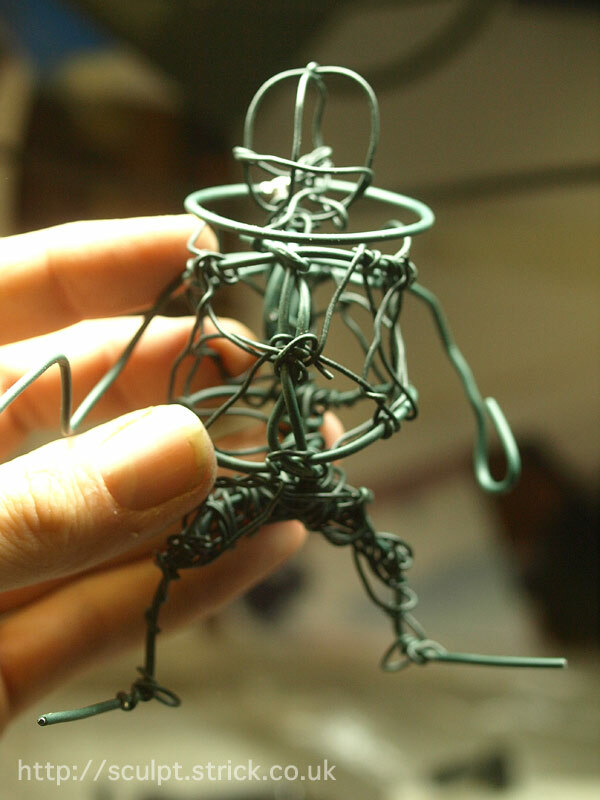 I began by making a simple wire armature using my pencil sketch for reference. I built up the basic form in Milliput. The neck joint for the helmet needed to be as clean as possible so I turned that on my lathe and added it to the sculpt at an early stage. I used an ABS plastic dome for the visor of the helmet and parts cut from another for the back. I then sculpted the rest of the helmet in Milliput, incorporating my turned neck joint. I formed its interior as a gently tapered hollow cylinder to be sure that it would release from the mould cleanly. 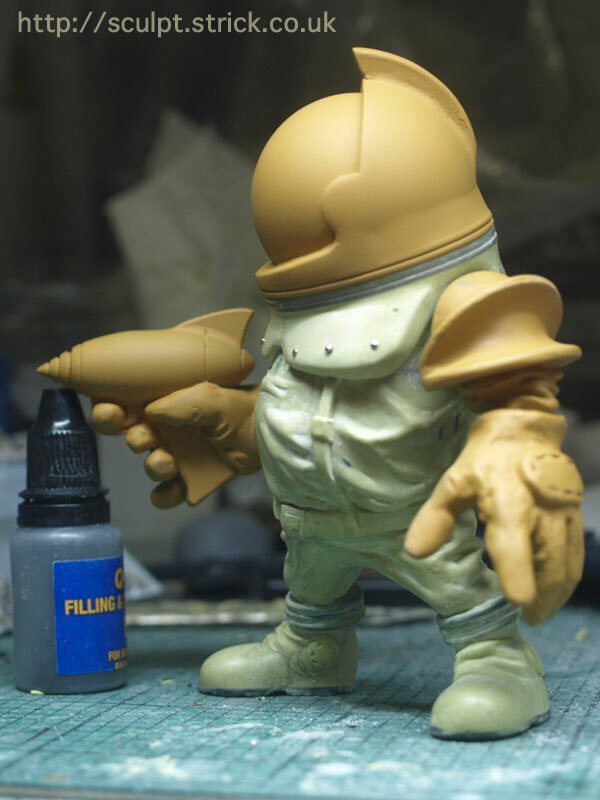 I turned the body of the raygun in nylon, added a styrene fin and acrylic grip, then detailed it with Milliput. I then built the gloved hand around it. Once the model was built, it was time to make the moulds. 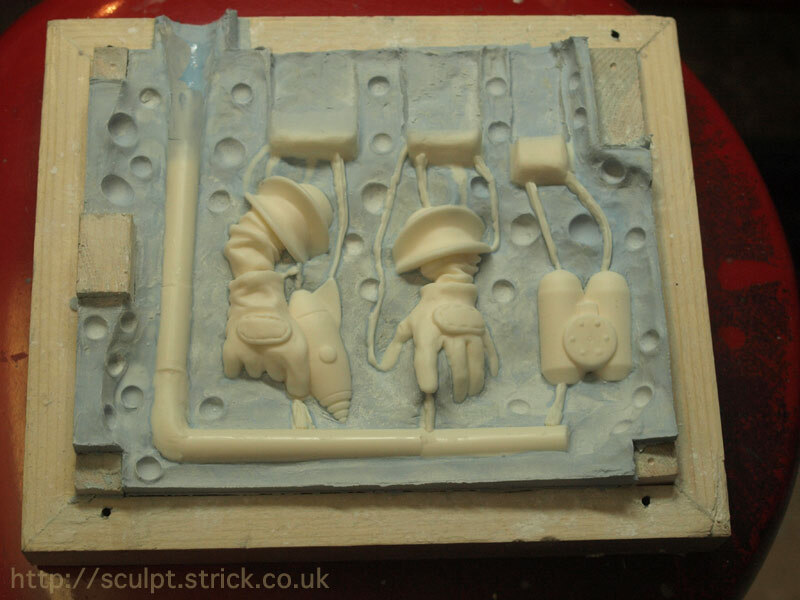 All the main moulds were made from silicone supported in wooden frames. I started with the helmet as I knew that would be the most complicated. I used a three-part design that would allow for easier release of the finished piece without putting too much stress on either the casting or the mould and would allow me to adjust the vents and gates more easily. After an initial test pour, I decided to raise the height of the pouring reservoir to provide a little more pressure to force the liquid resin into the mould, ending up with a four-part mould. 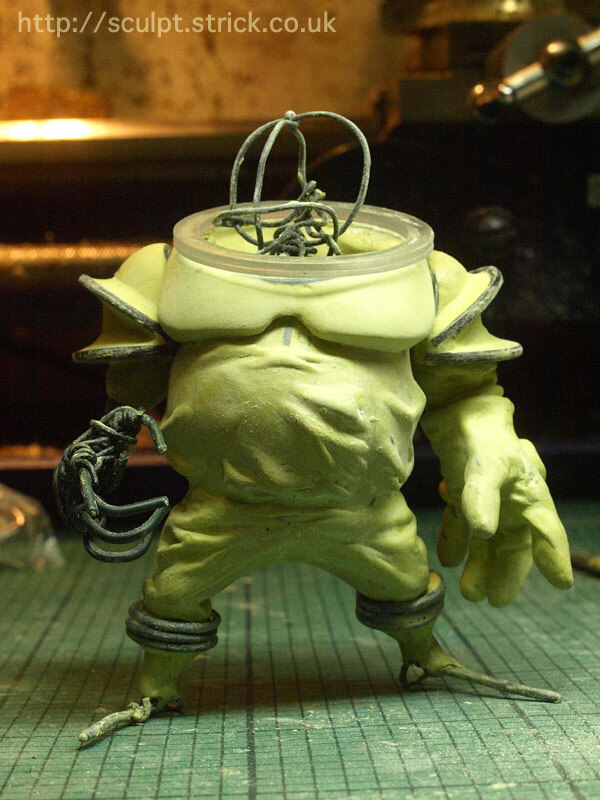 The mould for the body was a simpler two part mould. 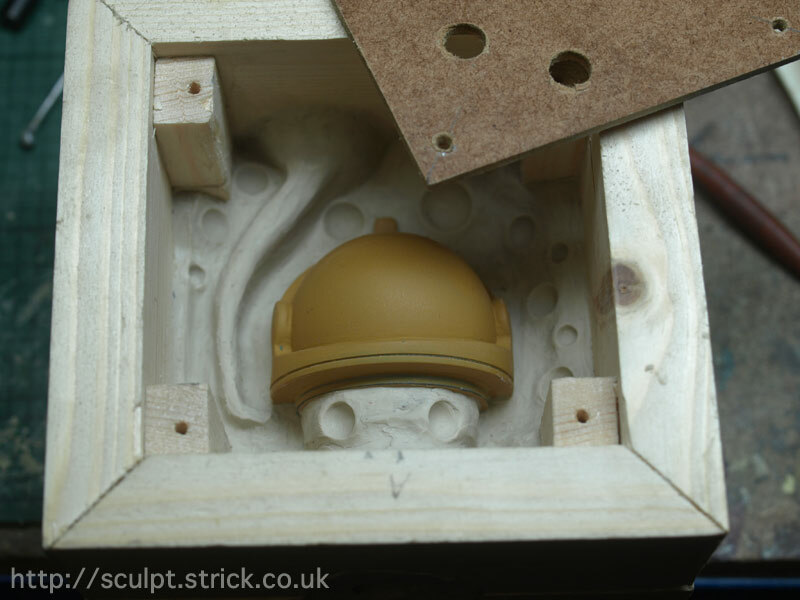 I again opted for an extended pouring reservoir but in this case incorporated into the initial mould design. Irritatingly, the mould proved slightly temperamental, occasionally refusing to fill completely due to air bubbles. 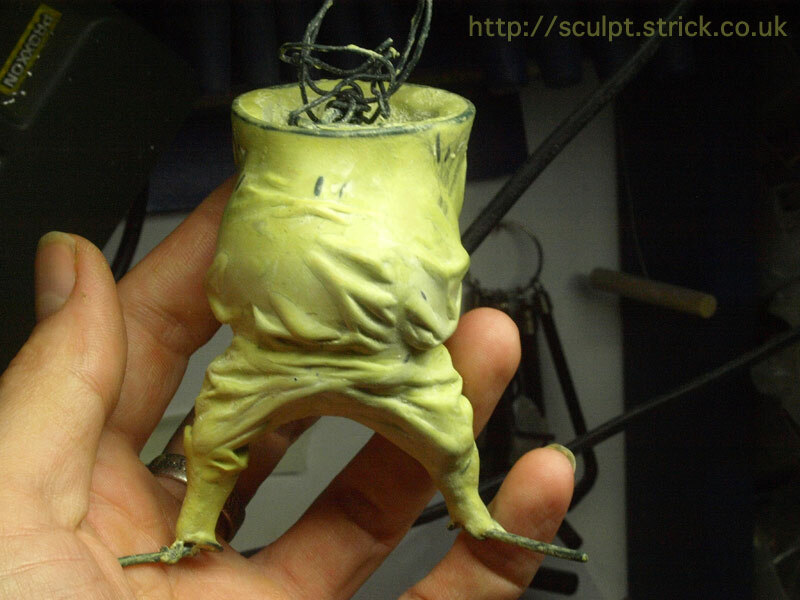 This is particularly frustrating for large pieces like the body as a failed cast wastes a lot of material. I decided to cast both arms and the back pack all in one mould. This is more efficient time-wise but does result in a little more waste due to the larger reservoirs and gates that feed the parts. The arms were quite complex and needed a network of vents to avoid trapped air. Mould design is both an art and a science. The main job is to allow air to escape from the mould at the same rate as the casting material is poured in. If there is not enough pressure behind the poured resin, it will not be able to push the air out and you end up with a void in the casting. It's important to predict each area where air is likely to become trapped and add a vent so that it can escape. You also need to predict the drop in pressure as the resin moves further from the pouring reservoir or where its flow is constricted by narrow parts of the mould and allow for it by increasing the diameter or number of vents, making it easier to push the air out. Because i would need to cast far fewer of each head than of the other parts, I was less concerned about the durability of the head moulds and decided to go with the simplest possible option; single piece moulds. 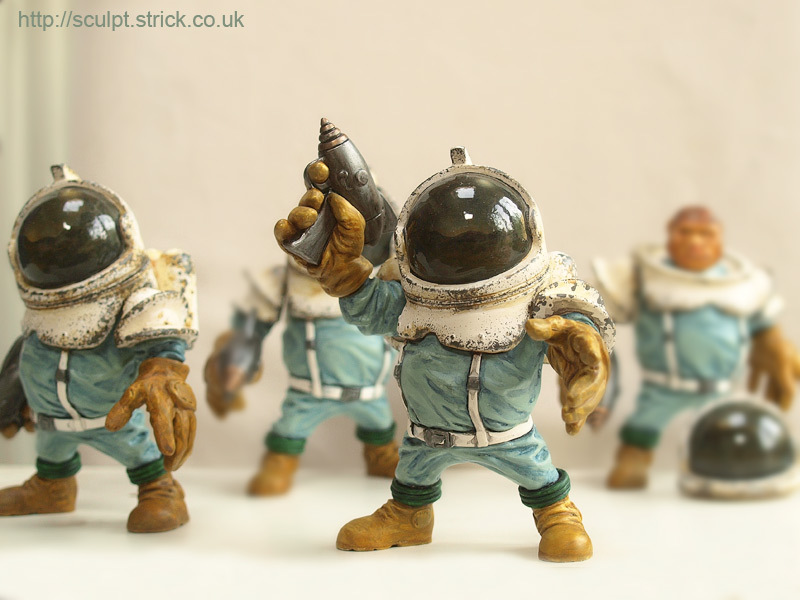 I wanted a slightly vintage feel to the colour scheme in order to complement the clasic sci-fi look of the design. 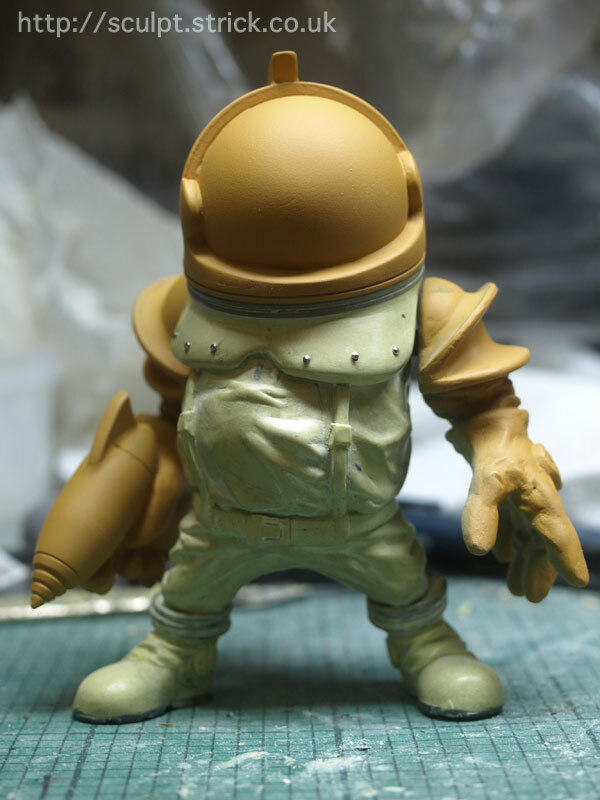 I decided to apply weathering to the armoured parts of the suit that subtly evoked a worn tin toy. The fun thing about producing several of these was that each one could have slightly different levels of weathering, giving them different character. However, as I proceded with painting the figures, it became clear that the scheme I'd designed was too complex to be practical for a large batch. Even though my style is more rough and impressionistic than many designer toys, it needs multiple passes and simply took too long to complete each piece. If I produce any additional versions, I'll need to either to use a simpler paint scheme or to increase the price. Pictures of the completed Ray figures are here.